Copenhagen is one of the best places in the world to be a cyclist but there is a downside - thousands of parked bicycles. Sometimes it gets out of control. When this year Copenhagen got its Cykelslangen (Cycle Snake) - a new two-lane, bicycle-only bridge across its harbour - the city edged even closer to being a cyclists' paradise. It's not the only bridge in the city designed for cyclists, but it got cyclists out of the way of sauntering pedestrians on a harbourfront, it wriggled in a pleasing way and it looked great. The number of city dwellers who commute by bicycle is above 50%, and a recent survey suggests that even when you add in people who start their commute outside the city 41% arrive at their place of work or study thanks to pedal power. There are in fact more bicycles in Copenhagen than people, five times as many bicycles as cars, and 400km of cycle lanes - not shared with cars or pedestrians - for a city of about 600,000 people. This has many obvious benefits, such as cleaner air and physical fitness. If only more thought had gone into what happens when riders get off. Cycle parking is a shambles here. Outside the main train stations, you could be forgiven for thinking there'd just been an accident. Piles of bicycles clustered around the racks look like they've been thrown down by someone on the run from the law. Elsewhere, bikes are often parked randomly on the pavement, taking up pedestrian space and blocking entrances to shops and restaurants. For many non-cyclists, it's a constant source of irritation. Niels Jarler, a non-cyclist in his 30s, says he often has to walk on the road to get to his flat in central Copenhagen at weekends, the pavement is so cluttered. "It's really infuriating. 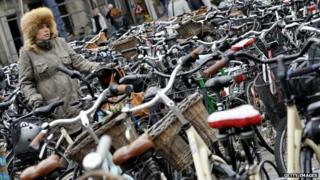 I think cyclists in Copenhagen have always parked wherever they wanted, but it's become more of a problem now that the population is growing rapidly," he says. "Urban planners haven't really thought properly about cycle parking at a local level." Although theft is a risk - almost 18,000 bicycles were stolen in the city last year - owners rarely chain their bikes to anything. Often they are just stacked one against another. "I ride an inconspicuous old bike, and I've never had it stolen so far," says student Anton Pilmark. "I'm banking on safety in numbers." While this may mean there is a low probability that your bike is the one that gets taken, untangling your trusty steed from the dense web often requires vast amounts of patience. Outside Copenhagen's central train station, where people often leave their bike for the weekend, plenty of cyclists are fed up. "There just isn't enough space," says Kirsten Hoeholt, a ceramic artist. "It's not just here that it's a problem, it's all over town. We need better parking facilities." Another cyclist told me she had struggled to find a place for her bike. Equally, it can be tricky to find your machine amid the clusters, unless you remember exactly where you left it. While 95% of cyclists in the city are happy with conditions for cyclists overall, only 29% are satisfied with cycle-parking facilities - down from 40% in 1996. According to Mikael Colville-Andersen, of the Copenhagenize Design Company, cycle parking is the "last great bastion" that cycling-friendly cities have yet to overcome. "No city has cracked it," he says. But he adds: "It's a challenge that other cities should beg for." In London, for example, fewer than 4% of people pedalled their way to the office at the time of the 2011 census, despite a rapid rise in the numbers commuting by bicycle in the preceding decade. London Mayor Boris Johnson vowed last year to make London's streets "as popular with cyclists as the streets of Copenhagen or Amsterdam", but there is a long way to go. One of Copenhagen's problems is that it has been growing rapidly. About 12,000 people are moving to the city each year, while only 7,000 new cycle parking spaces have been created over the last eight years. "Many of these newcomers are cyclists, and the city authorities just can't keep up," says former deputy mayor Klaus Bondam, who used to act in Dogme films but now leads the Danish Cyclists' Federation. There is a huge number of areas in London where more cycle parking is needed - Borough Market is one. Covent Garden, Piccadilly Circus, Carnaby Street and Soho are other areas regularly flagged up. Where stands are provided, they're often full. When cycle parking isn't available, people will often lock to street furniture, which is harder to lock your bike securely to. Provision of cycle parking has been inadequate for decades, but the recent increase in the popularity of cycling means it's a bigger problem than ever. "We need more drastic measures to sort this out. In the Netherlands they have state-of-the art parking facilities over several floors. I think it's time to introduce that here as well." In the Dutch city of Groningen, the central train station has underground parking for 10,000 bikes, operated by a guard day and night. In Utrecht, a new cycle park over three floors at the central station has room for 4,300 bicycles - but it will soon be put in the shade by another facility to the east of the station, with room for 12,500. "We try to steal as many good ideas as we can, and we have a very good working relationship with [city planners in] Holland", says Andreas Roehl from Copenhagen city council, noncommittally. A few years ago "bike-butlers" were introduced in some areas. The butlers pick up bicycles that have been knocked over, pump air into flat tyres and give the bike-chains a bit of oil, to thank people for parking properly. So some changes are on the way. For now though Copenhageners will still have to contend with getting chain oil on their hands and their clothes as they dig their way through the mountains of cycles that pass for bike racks.